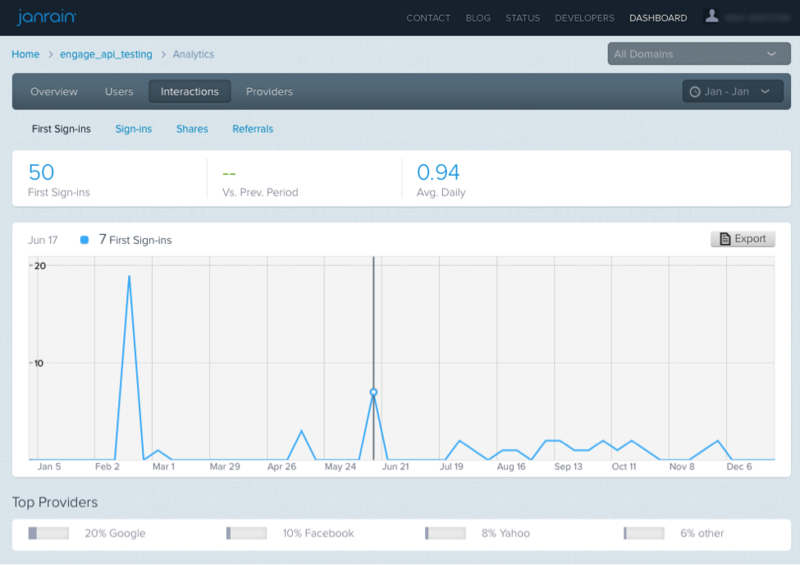 Interactions reports feature a similar user experience, but report on event counts rather than unique users for first sign-ins, total sign-ins, shares, and referrals. Interactions reports do not have selectable series. Rather, the line is a total and the provider breakdown is shown only for the top providers. Hovering over the provider displays the count of events for that provider just above the chart. Interactions/First Sign-ins — This report displays users who have signed in to the application via any of the whitelisted domains, for the first time. This is a non-unique count, but behaves similarly to a unique count since the same user ID cannot be counted as a first sign-in more than once. For example, if a user signed in for the very first time and then two more times on June 17th, and then five times on July 8th, that user will contribute 1 to the June 17th count and 0 to the July 8th count. Interactions/Sign-ins — This report displays all sign-in events for the selected time period. Interactions/Shares — This report displays a count of all share events completed by social sharing. Interactions/Referrals — This report displays a count of all referral events (clicks on a share from social sharing) that returned a user to the shared content. The referred users do not need to sign in in order to be counted as a referral, and the referral event may not have occurred in the same period as the original share event.